As is known to all, MPG/MPEG is one of a number of file extensions for MPEG-1 or MPEG-2 audio and video compression. In short, MPG/MPEG is compressed with MPEG-1 or MPEG-2 and usually used with VCDs and DVDs. Comparing with MP4 (MPEG-4), MPG can provide more superior video quality due to the compression feature. But commonly, it's hard for users to tell the quality difference between MPG and MP4 on mobile devices since they do belong under the same group. To enjoy MPG's superb video quality, you can play MPG/MPEG files on HDTV. In fact, the main difference between MP4 and MPG are the players and devices that can play them. This is also why so many people have requirement on MP4 to MPG conversion. For now, there are many video players support MPG files like VCD player, Windows Movie Maker and more MPG video players or video editing software. If you wanna play MPG/MPEG videos on devices which only support MPG files, you should convert MP4 to MPG video format. * convert MP4 to MPG/MPEG with original quality reserved in 5X faster speed than other MP4 to MPG converters thanks to its multi-core CPU utility, hyper-threading tech and Intel Quick Sync Video hardware acceleration tech. * edit MPG video files with its stunning video editing features like clipping, cropping, merging, adding watermark/subtitles, etc. * convert AVI to MPEG/MPG, MKV to MPG, YouTube to MPEG, VOB to MPG, etc. * decode MP4 to MOV, AVI, FLV, MKV, AAC, AC3, etc or other 180 video formats and 14 popular audio formats on Mac/PC for free playback or editing. Prior to MP4 to MPG transcoding, you should download this MP4 to MPG converter on your Mac (macOS Sierra/El Capitan included); please download Windows version (Win 10/8/7 supported) if needed. Next, follow the below steps to convert MP4 to MPG. Fire up this topmost MP4 to MPG video converter on your Mac/PC and click "+ Video" button to load the MP4 video file that you want to convert. Or directly drag and drop the MP4 video to the program. BTW, batch conversion is supported. Set MPEG1 or MPEG2 as the output video format from the drop-down list of Output Profile. In addition to MPG, you are also allowed to choose MOV, AVI, FLV, iPhone 7/7 Plus/SE/6s, iPad Air 2, iPad Mini 4, iPad Pro, Apple TV 4, iTunes, iMovies, Samsung Galaxy S7 edge, HTC One M9, etc as the output format to convert MP4 to MOV, MP4 to AVI, etc. Click "Browse" button to choose a destination folder for saving the converted MPG file and tap "RUN" button to convert MP4 to MPG Mac/PC. 1. 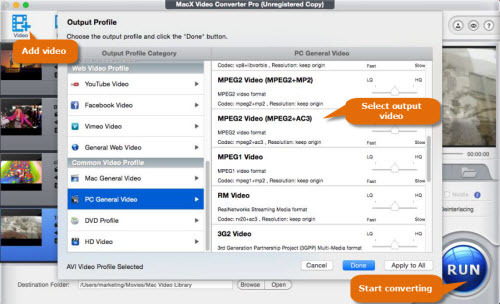 In addition to MP4 to MPG conversion, this video converter for Mac also supports downloading MP4 or MPG/MPEG video from 300+ online sites like YouTube, Dailymotion, Vevo, Vimeo, Twitter and more. 2. MPEG-1, MPEG-2 and MPEG-4 are all MPEG standards and developed for different purposes. If you want to play video on mobile devices or upload to online sites for sharing, you should choose MP4 (MPEG-4); if you desire to stream video on HDTV or other high definition devices, you can choose MPG/MPEG (MPEG-1 & MPEG-2). Download the topmost MP4 to MPG video converter - MacX Video Converter Pro to easily convert MP4 to MPG/MPEG on macOS and Windows with original quality reserved in 5x faster speed than other MP4 to MPG converters.